It was a wonderful sight! Absolutely perfectly serene, the promise of a beautiful day. Wonderful photo. I am very very lucky with the views I get travelling to work! Thank you – it was a beautiful morning! Glad you stopped the car and pulled over for this one.This one is National Geographic worthy – great shot with the added bonus of the lambs – I love the light, reflection and composition. Beautiful! Am glad you liked it. It was one of those no brainers as soon as I saw it. I must have looked a bit strange though as had to park up off the road and run back before the light changed! Always happy when things work out and you MUST take the shot. So glad you stopped to take this. I love this time of day as the morning transitions from grey to colour. All of the reflections and layers in your composition are lovely! Thank you, and yes it was a wonderful morning! Yes, it is very beautiful, Lisa. Beautiful tonal range and very nice composition. I always miss those misty foggy mornings due to a late to bed, late to rise sleep cycle. Of course you had to stop! Love the delicate pastels, your tight crop, and the overall composition. I can clearly remember several occasions when I was on my way to work-related activities in your part of the world and was struck with a sudden magical natural offering around a corner and having to stop and savor the moment and try to capture some of its essence. I tried really hard not to dally when on a work-related mission, but sometimes that’s just not realistically possible. I am now eager to dig up a few more of these to share. Pastoral, beautiful! 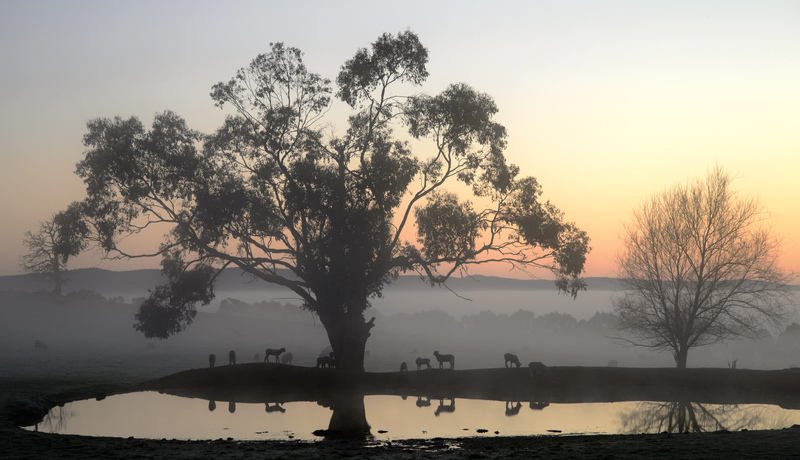 I don’t know what O like best about it – the lambs, or their reflections, or that great tree, or the fog rolling in the valleys beyond or the sunset. Wow, Lisa!